Approach the negotiation from the other’s perspective first. What matters to them? What’s it like to be on their side of the situation? What are they afraid of? Hopeful for? Aim for fairness over time rather than fairness in one instance. If you set your sights on the relationship, not a transaction, suddenly you have a large set of options for achieving fairness. Speaking of time, imagine your first negotiation is your 100th negotiation. Bring that kind of comfort and candor and you’ll set a lasting and memorable tone. Share what is at stake for you. The other party can’t help you achieve your objectives unless you’re open about them. And the more you give away freely, the more you are likely to receive in return. Be candid about your shortcomings. Don’t hang your head low about them—of course you can’t be all things to all people. Don’t hide your strengths, either. Don’t hide anything, period. Bring everything that is being said elsewhere to the table. How else can you have a real conversation about things that matter and need to be addressed? Be unwavering in your commitment to create joint goals and joint approaches. For real. Even though it can be really tough to do this. Do the hard work required to get to the underlying drivers and motives. You might have to make risky observations or ask risky questions. So be it. Consider that no-deal may be the best outcome for everyone. Be willing to walk away. Do this because it’s a healthy mindset to bring into a conversation, not because it’s a manipulative tactic that might help you get what you want. Be someone around whom others have the psychic freedom to choose what’s best for them. You can be committed without being attached, which frees others up to be candid when they have concerns, and genuinely excited when they’re all in. When you follow this checklist, you don’t just negotiate better deals; you create richer relationships. Real relationships. The only question is, just how trustworthy are you willing to be? 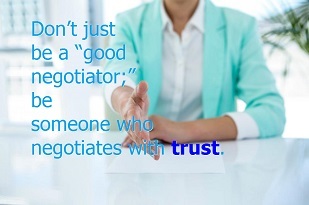 This week, bring to mind a recent negotiation that you were involved in or observed. Evaluate it, using this checklist. What went well? What could have been improved? 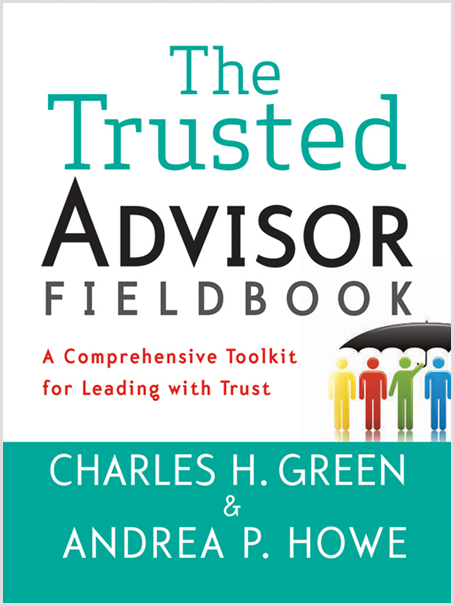 Discover how the demand for “fairness” can be the enemy of trust, from our friends at Trusted Advisor Associates, or read a story about an emotion-laden negotiation in Chapter 26 of The Trusted Advisor Fieldbook.